The 2015 Pine Crest Invitational is the largest one yet over the meets four year history. Over 45 teams will make their way to Mills Pond Park in Ft. Lauderdale. See what individuals and teams have the best shot at winning in our virtual meet/ Flrunners.com will have on-site coverage as well as results, and a recap of all the action following the meet! The ladies of host Pine Crest have been a force to be reckoned with three weeks into the season. 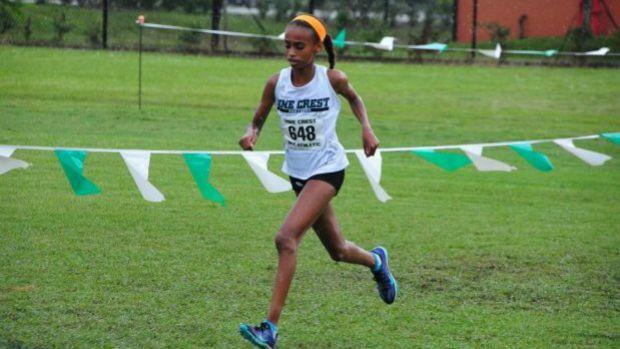 The Panthers recently tallied 29 points to win the Horse Park Invitational in Ocala led by runner-up Tsion Yared. The 8th grader is the top individual heading into this race and is also the defending champion of the event. She is the only one in the field who has run under 19 minutes so far. Gulliver Prep transfer Alyssa Pujals has been a welcomed addition to this team to go along with senior Julia Montgomery, Yared's younger sister Mahdere and junior Simone Vreeland. Expect all five to place within the top fifteen on Thursday. Also in the mix with the top group will be Dillard senior Brittany Gill who after a successful track campaign, won her first ever cross country race at the King of the Hill CC Invitational last week in 19:13.45. Freshman Nicole Matysik of Key West won her first race of 2015 at the Wickham Park Jamboree, while 8th grader Natalie Varela is a youngster with a ton of potential. Jasmine Hincapie, an 8th grader from Boca Raton Christian School has also dipped under 20 minutes this season. The team battle won't even be close with the host Panthers leading the charge. St. Brendan's scored a surprise team win at the Estero DDD Invitational and are looking to post a fast time to make the flrunners.com Race of Champions. North Broward Prep, Westminster Academy and Boca Raton Christian School round out the top five. On the boys side it's no secret that powerhouse Belen Jesuit is making the trip to Ft. Lauderdale. Wolverines sophomore Joshua Collins was victorious in his first two races and finished runner-up last week at the King of the Hill CC Invitational behind Carlin Berryhill of Coral Reef. The Belen boys like to run together, but their might be some green and white in that pack of navy and gold. Pine Crest junior Michael Kennedy won the Horse Park Invitational last weekend and is looking to add a second "W" to his resume this year and split up Collins and his teammates Bruno Zayas and Nicolas Roca. Jake Gilbert and Alex Caldwell, two seniors will be in the top pack for the Panthers as well. Other names to watch include Brandon Williams of Chaminade-Madonna College Prep, Ryan Szklany of Highlands Christian Academy, Jaime Lopez of Belen, and Tucker Hindle of Boca Raton Christian School. The team battle will come down to Belen and Pine Crest. If the Panthers have a shot at knocking off the Wolverines they will need to be on their 'A' game and have a strong showing out of number five Matthew Stein and the rest of the team! Westminster Academy and Archbishop McCarthy will fight for third.